Chief Master Sergeant Morris assumed the duties of Joint Staff Enlisted Advisor on 15 September 2016, California National Guard Joint Force Headquarters in Sacramento, California. Chief Morris enlisted in the United States Air Force in August 1983. He attended Basic Military Training at Lackland Air Force Base and graduated in April 1984 from the Wideband Communications Equipment Specialist Course at Keesler Air Force Base. His first unit of assignment was with the 611th Tactical Control Flight, Azley Air Station, Germany. 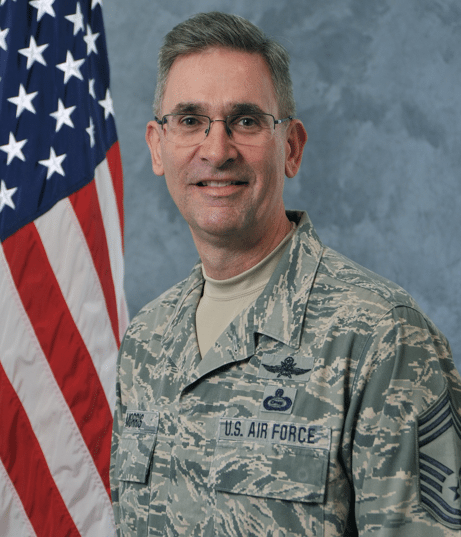 Chief Morris enlisted in the California Air National Guard in August 1994 and has served in various positions of increasing responsibility. His assignments include Technician/Supervisor/NCOIC Satellite Wideband Communications Maintenance, and Radio Maintenance Superintendent. He then attended the Operations Intelligence Apprentice Course at Goodfellow Air Force Base, graduating in August 2005, with follow assignments as Operations Intelligence Superintendent, Squadron Superintendent for the 222nd Operations Support Squadron and 234th Intelligence Squadron, and Superintendent, 548th Intelligence, Surveillance, and Reconnaissance Group. Chief Morris is a graduate of California State University Stanislaus and holds a Bachelor of Science Degree in Applied Studies. His military education is highlighted with attendance at the Air Force Senior Non-Commissioned Officer Academy and completion of the Air University Air Command and Staff College Distance Learning Program. Chief Morris is a graduate of the Joint Task Force Commander Training Course held at NORAD-USNORTHCOM. Chief Morris’ awards include the Meritorious Service Medal, Air Force Commendation Medal, Air Force Achievement Medal, Meritorious Unit Award, Air Force Outstanding Unit Award with Valor device, Combat Readiness Medal, Armed Forces Expeditionary Medal, Humanitarian Service Medal, Air and Space Campaign Medal, California Commendation Medal, The California Commanding General’s Meritorious Unit Citation, and numerous other awards.